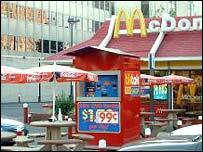 McDonald's has reportedly decided that its experimental network of automated convenience stores was an idea too far ahead of its time. The fast-food giant, in the throes of painful restructuring, has pulled the plug on its Redbox 24-hour coin-operated kiosks. The four Redboxes in the Washington DC area have been shut down, the Washington Post newspaper reported. But McDonald's is keeping its 12 automated video stores. Redbox is one of a number of "partner brands" - which include British sandwich chain Pret-a-Manger - that sit outside McDonald's core business. The firm does not disclose detailed results for these occasionally experimental activities. But Redbox was reckoned to have been dogged by technological problems and low profit margins. Initially launched as Tiktok Easyshops, using US-built technology, the kiosks were rebranded and revamped with help from Belgian firm New Distribution Systems (NDS). This allowed the kiosks to stock a wide range of groceries, including fresh foods, available via a touch-sensitive screen. When a product runs short, support staff are alerted by an automated e-mail. 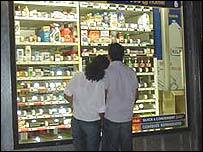 The aim was to prosper in one of the toughest areas of retailing: convenience stores suffer from high wage costs, low margins and rising retail rents. The concept was widely hailed as a triumph, pointing the way for the future of retailing. Redbox was even named as one of Time magazine's "Best New Inventions of 2002". But the machines proved more expensive to run than some had anticipated, in particular the sort of sophisticated technology needed to keep perishable produce fresh. And, some experts say, American consumers were wary of the vending-machine concept, preferring the personal service available in traditional stores. This is a sharp contrast with Continental Europe and Japan, where lack of space, business overheads and short shop opening hours have long fostered a vending-machine culture. In Europe, for example, NDS has already installed 160 fully-automated shops - for clients other than McDonald's - and has plans for another 400.